For Tennis, Fitness and Fun! Life here at the Seal Beach Tennis Center is about much more than competitive tennis. We offer a wide variety of special and fun activity packages great for corporations, local businesses, schools and even family gatherings! These packages are available 7 days a week in the afternoon. Corporations and Businesses - Hold your next training or team building event here at the SBTC and use our Clubhouse for your work and lunch. 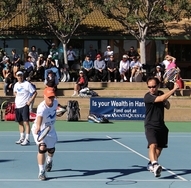 Then we provide fun tennis activities on the courts with our wonderful tennis pros. Schools - Encourage your students to exercise and get physically fit by reserving a Wellness Day Package! We can conduct fast moving (but non-competitive) tennis related activities guaranteed to provide fun and exercise. We can even provide the tennis racquets. Families - Have your next birthday party or family reunion with us! Enjoy use of the Clubhouse and patio areas for your lunch or dinner, and then have a blast enjoying a series of fun tennis games on our courts. Your entire party will laugh and have a great time. The costs for the various packages will vary depending on the program we set up with you. Cost can be as low as only $7 per participant for a two hour birthday party, or $13 per employee for a four hour training day. Give us a call at (562) 598-8624 and we can develop a fun and affordable plan. Pickleball - A game for all!